The world’s most awesome family tours From new perspectives on classic destinations to thrilling adventures in far-flung locales, we uncover the organised family tours that will awe travellers of all ages. Our writers have travelled the globe to bring you the hottest experiences in family holidays: indulging in la dolce vita in Italy, enjoying the spectacle of Britain’s annual Horse of the Year Show, experiencing the underwater delights of Vanuatu and disconnecting at Fiji’s Malolo Island Resort. We also discover why Vietnam is one of the best destinations in Southeast Asia for culture-seeking families, bring you the latest from Disneyland (hint: Pixar) and give you 29 reasons to say ‘Aloha’ to a Hawaiian holiday. We then delve into Japan, sharing three different perspectives on this awe-inspiring nation. Our new section shares everything you need to know about travelling with tots. 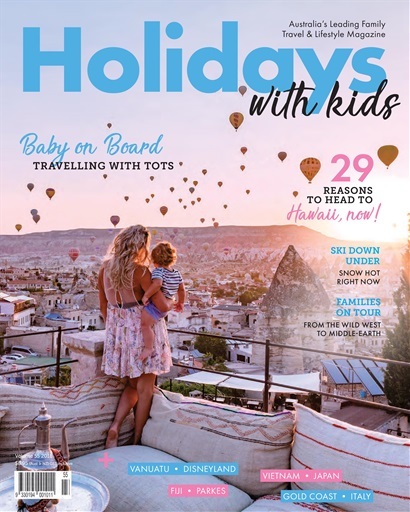 Laze on the beach with our guide to Asia Pacific’s best resorts for bubs and prepare for your next adventure with our baby carrier reviews. 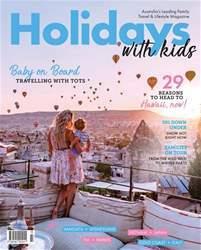 We also chat with our cover star, Kirianna from Riley’s Travels, about seeing the world with her 18-month-old son.